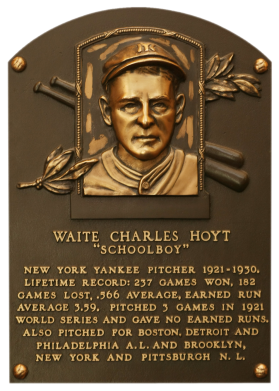 The Yankee pitching ace of the 1920s, Waite Hoyt won 20 games only twice, but compiled a 6-4 record in the World Series with a 1.83 ERA. In 1927, "Schoolboy" led the AL in wins (22), winning percentage (.759) and ERA (2.63). He won in double figures 12 seasons and had a career 237-182 record. He was one of the first ex-ballplayers to work in broadcasting. Comments: In May of 2000, I purchased a group of 1960 Fleer PSA 8s from Vintage Sports Investments via their website - G. Alexander, H. Heilmann, H. Jennings, H. Newhouser, W. Hoyt and E. Collins. They were temporary placeholders until I found a contemporary portrait card issued during their careers. I upgraded the item to a PSA 9 with an eBay purchase in March, 2005. Then in January, 2006 I replaced the tribute card with this 1928 Yuengling's purchased from Marty Pritchard - a good friend in the hobby. 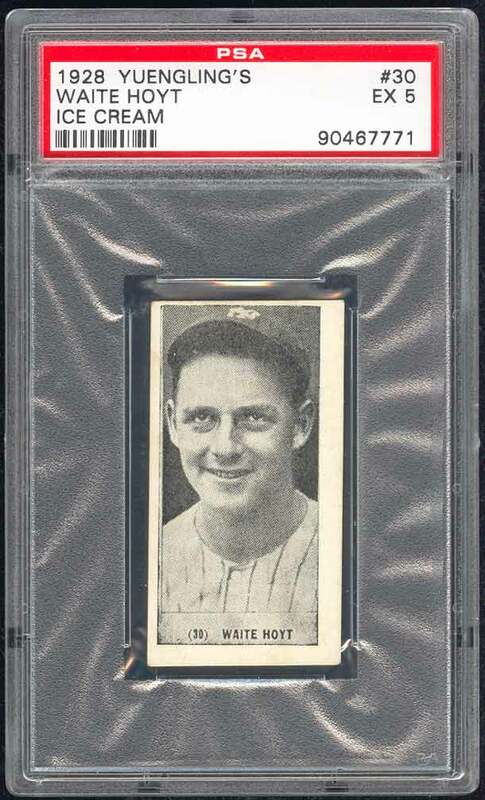 The card shown above is currently the highest graded example by PSA - a wondeful EX 5 with no qualifiers. 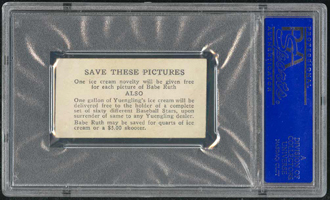 Description: Issued in 1928, the Yuengling's Ice Cream issue consists of 60 black-and-white cards measuring 1-3/8" X 2-1/2". The photos are similar to those used in the E210 and W502 sets. Other ice cream companies such as Harrington's and Tharp's produced nearly identical cards. Two types of cards are seen, though whether either or both can be found for all players us unknown. Besides typographical placement differences on front, the back of one type mentions a "$5.00 skooter" as a redemption, while the other type has no mention of the toy. 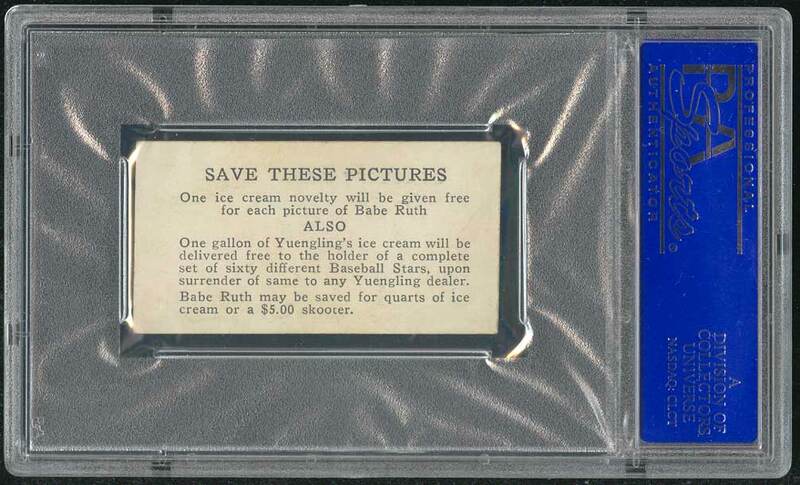 Collectors could redeem an entire set of Yuengling's cards for a gallon of ice cream.